Wow, what a day. Today I tried three new recipes- gotta love Sundays! My latest obsession is sweet potatoes, which is good because of all the health benefits. According to Wiki, sweet potatoes are rich in complex carbs, fiber, beta carotene, vitamin C, and vitamin B6. And they're so good, nearly a candy with a good cinnamon or brown sugar seasoning. Today I made sweet potato fries using a recipe from my Sandra Lee cookbook. Preheat oven to 400 degrees F. Line a baking sheet with aluminum foil and set aside. Cut potatoes in half lengthwise, then cut into 1/2-inch thick fries. In a large bowl, combine sweet potatoes, oil, and spices. Toss until potatoes are thoroughly coated. Spread in a single layer on the baking sheet. Bake fries for 30-35 minutes, turning once to evenly cook. One main ingredient that I always hesitate to work with is flaky fish, because I worry that I'm going to ruin it because it's so delicate. I decided that practice makes perfect though, so it was time to try fish again, especially because of the health benefits. I picked out a recipe from my Sandra Lee cookbook for Blackened Cajun Catfish, and its side Dirty Rice. The result was absolutely amazing and already one of my new favorite meals. Return skillet to medium-high heat. When oil is hot, add fish, presentation side (the side against the bone) down. Cook fish for 5 minutes per side or until fish flakes easily when tested with a fork. Transfer fish to a plate. Deglaze pan with white wine and lemon juice. Bring to boil. Reduce heat and simmer for 2 minutes. Swirl butter into sauce. Pour over fish. Serve fish over the dirty rice. In a medium skillet, heat oil over medium heat. Add onion, celery, and pepper to hot oil. Cook until vegetables are soft but not brown. Add broth (2 1/3c for regular cook, 13/4c for quick cook) and poultry seasoning; bring to boil. Add rice and seasoning packet. Cover, reduce heat to low, and simmer for 25 minutes (or remove from heat for 5-10 minutes if quick cook). Fluff with fork and serve. Wow, I can't say enough about this dish. It's moist and full of flavor. I enjoyed the challenge... not that it was THAT hard. This cookbook by Sandra Lee is really getting a workout. 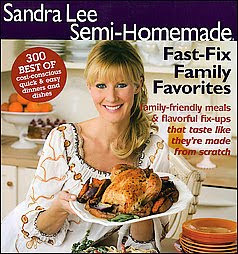 If you're interested, it's Sandra Lee Semi-Homemade Fast-Fix Family Favorites.